The holiday season sees marketing departments everywhere investing heavily in paid advertising, both on- and offline, as they compete for shoppers’ attention. However, as finding the perfect gift usually means doing a lot of online research, prominence in organic search in December is essential for retailers looking to make a success of their holiday season. The question is: What factors does Google consider when ranking eCommerce sites? What are users entering eCommerce-related queries looking for? 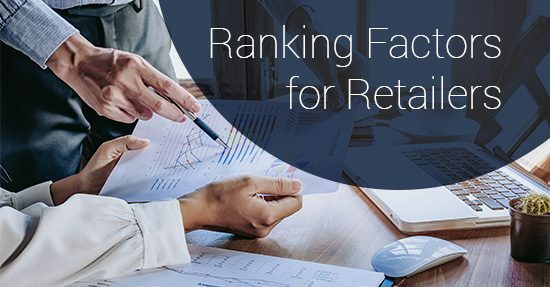 Read on to find out what matters for high rankings in eCommerce in 2018. 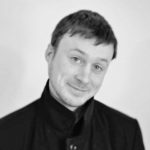 On 11th of December, Searchmetrics will be hosting a webinar, where CTO and Founder, Marcus Tober, will explain the topic of ranking factors for niches. Sign up to learn more about what it takes for online shops and sites of all industries to rank on Google. Nowadays, there are certain bread and butter SEO fundamentals, sometimes referred to as hygiene factors, that all websites need to be aware of if they hope to perform in Google search. But if you run an eCommerce business and you want to compete with other online shops, then you need to know what matters in your specific search environment. 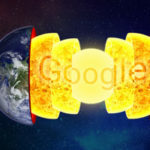 Google has long abandoned the approach of applying similar criteria to all search queries – now the way search results are compiled is much more granular and depends to a large extent on the context of the search query. 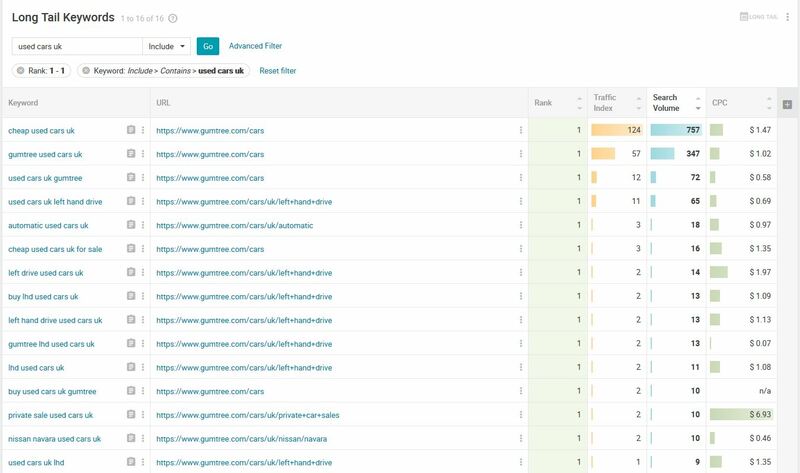 With this is mind, Searchmetrics started analyzing the ranking factors of specific industries, and found, among other things, that high-ranking eCommerce sites tended to have more internal links and contain more interactive elements than other websites. One site that does this well is gumtree.co.uk, which ranks number one for countless keywords, including numerous general, non-branded queries such as “cheap used cars uk”. The ranking data heavily suggests that gumtree are doing something right. And if we do a site analysis, we find several aspects of their webpage that tally with – or exceed – the standard set by other successful eCommerce pages. One aspect that stands out in the table is the file size. Gumtree’s pages are around 50% larger than the average for an eCommerce site ranking in Google’s top 10. On balance, this indicates that Google favors pages that provide more content over pages that go all out for a slimline user experience. Provided the content is relevant to what users are looking for, Google does not appear to punish eCommerce pages for a few additional bytes. The elephant in the room for all websites hoping to be successful in eCommerce is Amazon. Currently, amazon.co.uk is the fifth largest site in Google’s UK organic search index, and number one for paid search results. This makes Amazon a permanent fixture on the results pages for almost any kind of product-related search, comparable with Wikipedia’s dominance of the informational search market. For the vast majority of online retailers, it doesn’t make sense to go toe-to-toe with Amazon. But this doesn’t mean you should give up. 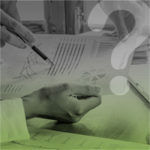 It just means that you need to identify your specialist section of the market and work out what it takes to win there. At Searchmetrics, we refer to specific markets as niches, and our 2018 whitepaper looking at Google’s Ranking Factors analyzes several niches, seeing how websites have to adapt to meet users’ needs in different thematic areas. One online niche within the eCommerce sector is furniture. A selection of ranking factors related to furniture, as published in Searchmetrics’ latest whitepaper, are show in in the table below. These findings show us that pages ranking for furniture keywords tend to have even more internal links than pages ranking for eCommerce keywords in general, they display a large number of images, have texts around 1,100 words long, almost never use tables, and have comparatively high file sizes. 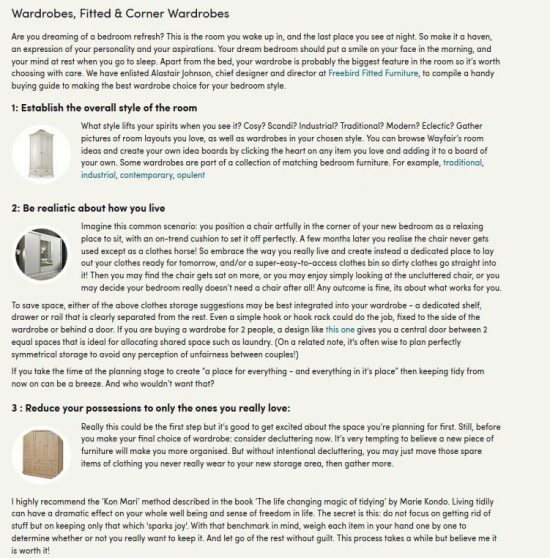 If we look at an example search query from this niche, “wardrobes uk”, then we can compare the pages ranking on position #1 and position #28. 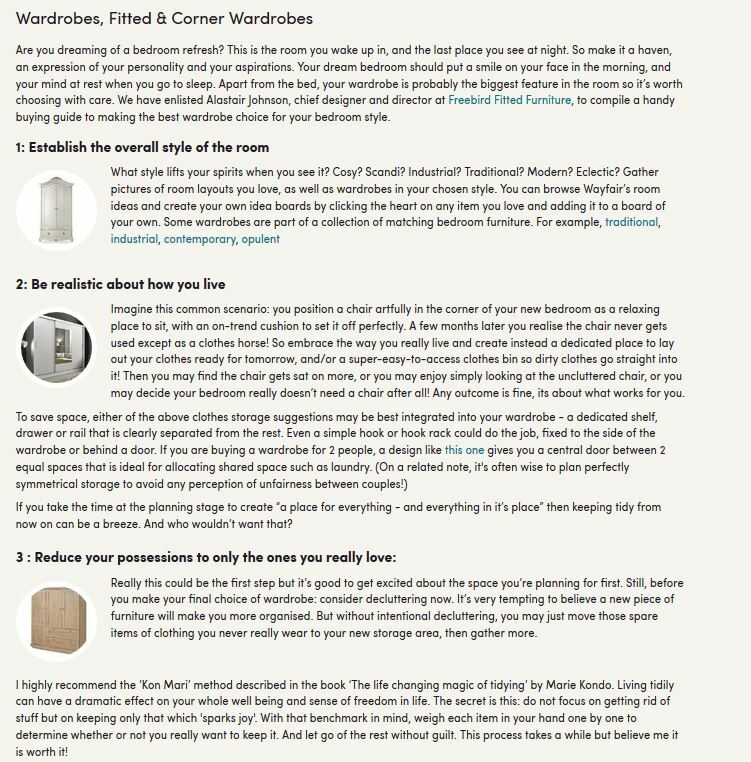 The image below shows excerpts from the wardrobe gallery pages of top-ranking wayfair.co.uk (left) and the much lower-ranking furnitureinfashion.net (right). 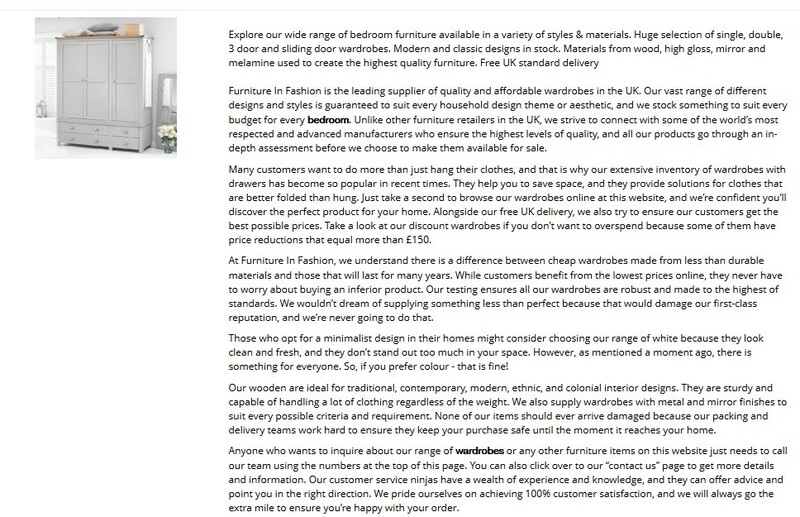 The main content on both pages is a gallery of wardrobes, including the product titles and prices. However, wayfair.co.uk has a few additional elements, such as a selection menu of product sub-categories and star ratings on every product. Small, but important changes can often have a big impact on a page’s performance. wayfair’s page performs strongly in the areas that are common amongst top 10 furniture pages. Users searching for furniture keywords are better served by image galleries offering more choice, and more links for navigating to other (related) products. Regarding links, it is not just the number that customers value, but their usefulness. wayfair offers “related searches” at the bottom of its page, something that is totally absent from furnitureinfashion.net. Furthermore, the file size of the wayfair URL is more than twice that of its competitor, underlining the point touched on earlier that reducing file size at all costs is not seen by Google as a trade-off worth making, if it means limiting the content offered to users. There are no headings, nothing to guide the reader, just two keywords bolded and very little encouragement for a human to actually read the text. Wayfair’s text, though also included for SEO purposes, provides value to the reader, is easier to read as it is structured into four numbered sections, and it includes an introduction that appeals to the reader’s emotions. wayfair’s text has an overall score of 78%, considerably more than its competitor. This is primarily driven by the superior keyword coverage. Furniture in Fashion’s text contains few relevant keywords besides “wardrobe” and “furniture”, and scores just 27% on this metric. 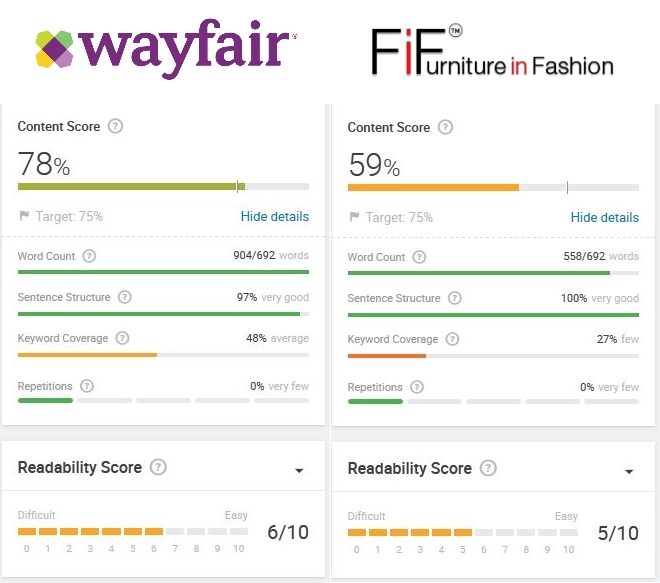 Wayfair’s content does a much better job of covering different aspects of the topic. These seemingly small differences show how vital it is to understand precisely what users and search engines are looking for, and how to meet their expectations, rather than simply attempting to implement SEO tricks and fill a page with a couple of your target keywords. Online shoppers, particularly in December, will often put hours if not weeks of effort into looking for the perfect gift for their loved one. The litmus test for a successful purchase is whether your nearest and/or dearest asks for the receipt and return address, or whether they actually remove the packaging on Christmas Day. With this ambitious goal ahead of them, and with so many products to choose from, it’s no surprise that most shoppers invest the bulk of their time in researching products and comparing options, rather than filling up their online baskets. In search terms, this means there is a much greater search volume higher for queries conducted up the sales funnel, where users are conducting informational searches. Transactional searches have a higher conversion rate, but these normally only happen after the user has searched for, and found, several pages informing their purchase decision. Too often, eCommerce sites neglect the informational aspect and give their undivided attention to product pages. This is, after all, where the cheques get cashed. 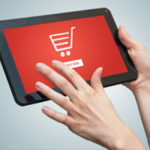 However, by ignoring the earlier stages of the sales funnel, these sites are missing out on an opportunity to get noticed by potential customers and position their brand as an authoritative, trustworthy source of information: one that customers are then more likely to return to once ready to make a purchase. Informational: The user is looking for information about a topic or product. Navigational: The user knows which website they want to visit. Transactional: The user is ready to purchase a product or service. The chart on the left shows that the search intent for 30.6% of the keyword set is informational. However, the chart on the right shows that our example domain only has top 10 rankings for transactional keywords and fails to rank on Google’s first search results page for any informational searches. The next chart shows the total Visibility of example.co.uk for all project keywords, divided along search intent lines. Just 16% of example.co.uk’s Visibility comes from informational searches. 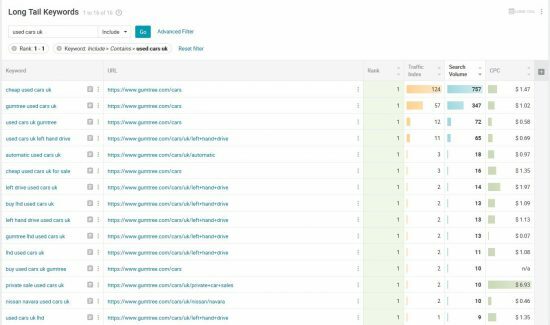 This is a clear sign of unused potential in the early stages of the sales funnel, which is further emphasized when looking at the traffic index for searches of different intent. This example is typical of many eCommerce sites. They may do a good job of optimizing their product pages, and they may rank for transactional searches. But they often miss out on the opportunities available when customers are still in the consideration stage of their journey. The examples covered in this article have looked at eCommerce sites, and, more specifically, sites doing business in the furniture sector. Clearly, the requirements in other industries and niches will not be identical to those in eCommerce. Somebody researching and buying a coffee table is hoping for a different user experience to somebody looking for the best way to cook a Christmas turkey. For any website, the aim is to understand the intent of your (potential) users as well as possible, and identify the factors that are most important for users searching around your relevant topics. If you know what your users want, then you have a chance to build a website that will meet their needs and outperform pages that haven’t yet understood the finer details of what is needed in your niche.